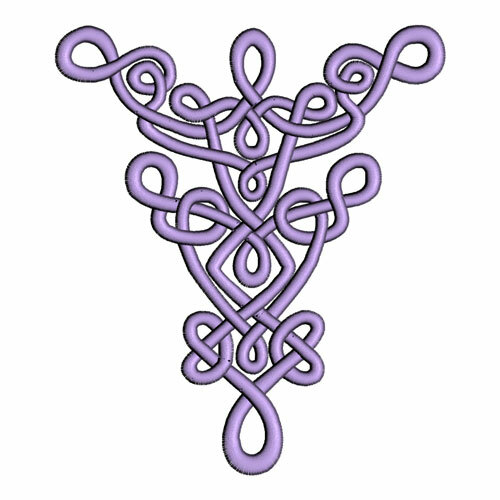 When I started digitising back then in 2007 I was determined to teach myself all about the beauty of Celtic Knot work. I attempted to draw these complicated designs fascinated with the way that they interweave forming intricate patterns. During my days as a bridal dressmaker I had struggled to find adequate embroidery designs for my brides who were having Celtic themed weddings. My Celtic collections are my answer to this need in the embroidery world. Celtic Dreams was my first collection, so aptly named by one of my customers! 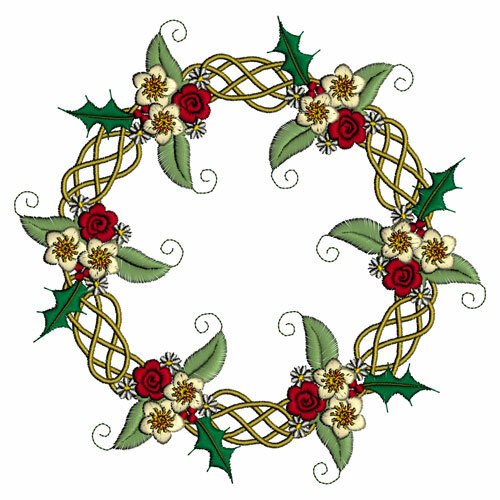 Then I decided to incorporate flowers within the Celtic ribbon work which has not been done very much at all and my first attempt was the very popular Celtic Christmas collection. Other collections have followed and I confess that I haven’t completed as many as I have planned in my head! Last year we had Celtic Ivy with quilt blocks and dimensional ivy. Thinking on the connection between Celtic designs and Ireland, I thought heather (Ericaceae) would be a perfect companion for more Celtic designs. There are so many lovely little flowers out there which are staggeringly beautiful when examined closely, but they are difficult to digitise for embroidery with that detail, as they look wrong if made too large. I knew exactly where to start to see if it would be possible to digitise heather successfully and that was at my local garden centre. As a child I was often mistakenly called Heather, and we had some heath land very near where I lived and I loved the bell heather that grew there. It was more exciting than the ordinary heather, as its flowers were larger. When I picked and shook it with a little childish imagination it sounded like a bell ringing. There it was among all the other varieties of heather and I decided it would be perfect especially as the little buds sit majestically above the flowers on some cultivars and the needle like leaves sit in groups of three at intervals up the reddish stems. Perfect for digitising! Here is my digitised heather and although I have chosen a reddish purple thread with the new buds and details a few shades darker (Sulky Rayon 1307 Petal pink and 1533 Light rose) when you stitch the heather out you can opt for mauve or even white. Imagine white heather designs embroidered on a wedding dress! You have to see the actual threads embroidered out to get an accurate representation of these colours. Be assured my spools accompanied me to the garden centre on my second visit! 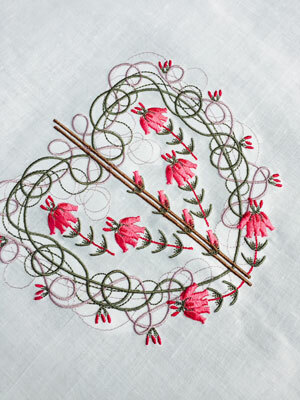 This close up of a stitch out shows how I have placed heather buds up the brown intersecting twigs. This feature will work well for borders and panel edges in the collection. Now I am working on all the designs which will form this collection of 5 sets for 4″ x 4″, 5″ x 7″, 9½” x 6″, 12″ x 8″ and 14¼” x 6″ hoops. 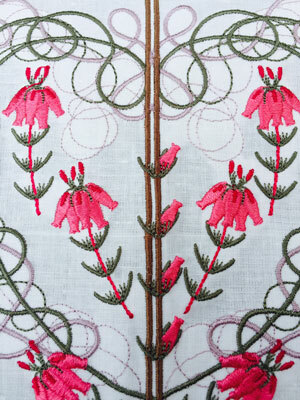 As well as doing this I am preparing something very special to showcase these lovely designs. My pale grey green silk arrived the other day and is waiting to be embroidered. I will share my project with you very soon. Next week it is St Patrick’s Day and it is intentional that I should choose the week in which it falls, to launch my new Celtic collection. Do call by my website next week as I am having a sale on all my previous Celtic Collections. The first designs in the Celtic Heather collection will be available on St Patrick’s Day, 17th March, 2015! 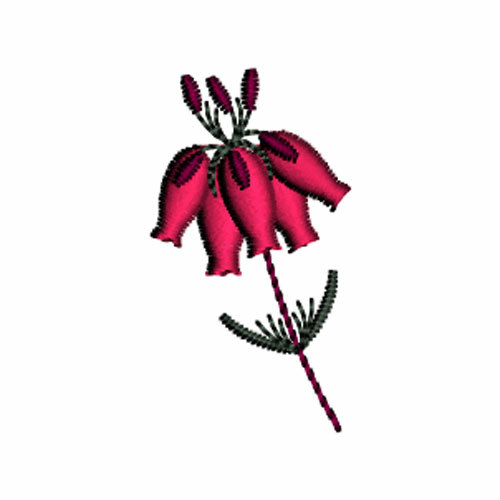 This entry was posted in Discussing machine embroidery, New Designs and tagged Celtic Designs, Digitising flowers accurately. Bookmark the permalink. What a wonderful idea to take your threads with you to the garden center! Breathtaking, I can’t wait to get these designs and play with them. Thank you Hazel for filling a true need in my personal embroidery wants. You are all very sweet! I am glad you like these designs as I am rather fond of them myself.